A New York State Senate candidate who sparked a firestorm after telling the I-Team he was planning to hand out "Kool Aid, KFC and watermelons" at a campaign event in Harlem has been arrested on grand larceny charges in connection to an alleged rental scam. 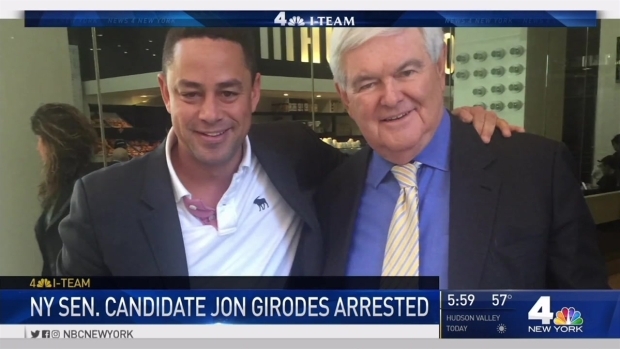 Jon Girodes, the Republican candidate for New York’s 30th District in the November election, was booked at NYPD's 7th Precinct on the Lower East Side Friday afternoon. He's facing at least nine counts of grand larceny. Girodes only smiled as he was walked out of the police station later in the night, telling the I-Team: "I love the NYPD and there are two sides to every story." The arrest comes days after he used the stereotypical reference in an email with the I-Team during an exchange about a disputed real estate deal. “Ps I'm hosting an event in Harlem which will be in front of the state building in a few weeks. We will [donate] Kool Aid, KFC and watermelons to the public on 125th street in Harlem. Please join us to help the community,” he wrote. Asked about those remarks as he was placed into a police car Friday night, the cuffed Girodes told the I-Team, "I know I'm hungry now." Girodes, who is making his second run for the 30th District senate seat and headlined his campaign website with an image of Dr. Martin Luther King Jr., said there was nothing offensive about his planned event. 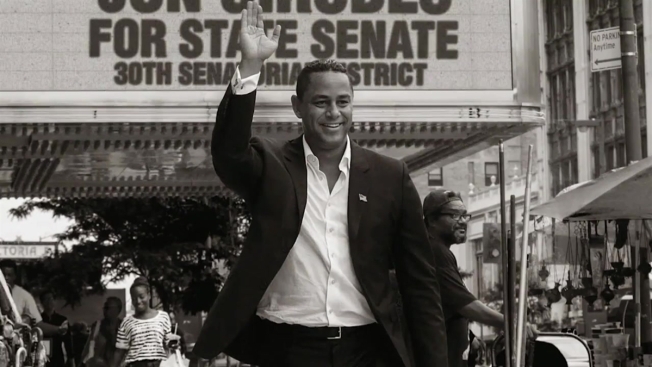 While Girodes offered no further details of his planned event, it was met with outrage in Harlem. Nancy Bandiera said she recently gave the politician a refundable $750 deposit to rent his luxury apartment on 42nd Street. But when she backed out of the deal, he kept her money. Girodes denied he has taken money from Bandiera or anyone else in apartment rental deals and called himself a victim. Attorney Pierre Gooding is representing 10 people who say they've been scammed anywhere out of $400 to $15,000 by Girodes and says there may be up to dozens more out there. "The scam is simple: he posts on Craigslist under his name or assumed name saying he's posting an apartment that's affordable because that's his initiative as a public officer," Gooding told NBC 4 Friday. "The person comes over, he shows them the amenities, wines them and dines them and then takes their money. And then he comes up with various reasons why he won't return that money." "It's the same apartment every single time, the same sort of lease structure," he said. "It's very obvious that there's no intent to ever rent out this apartment." Girodes’ campaign website and social media pages were taken down after the I-Team started its investigation. It's not clear if he plans on staying in the race. He has repeatedly claimed he's the victim of a conspiracy.